Hey everyone! 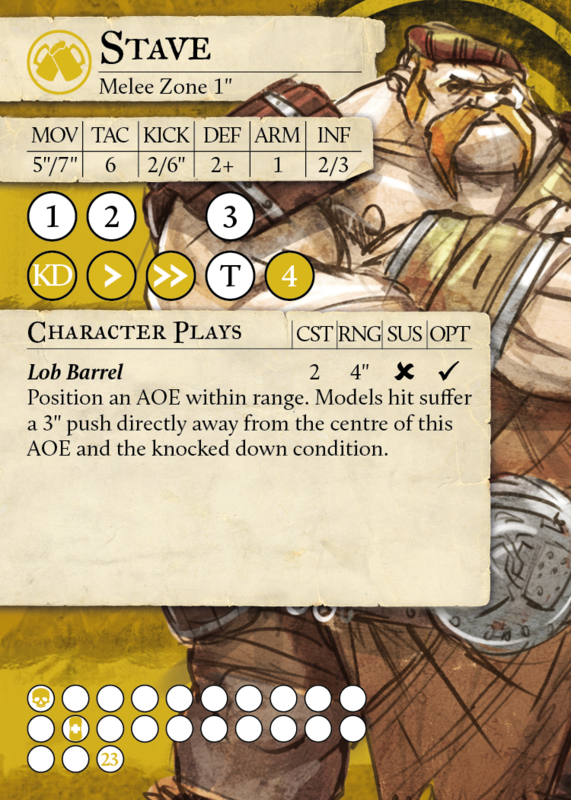 Welcome back the Guild Ball blog, today we’re going to be talking about a balance concern. We’ve been paying attention to the competitive results from the last month since the Miner’s Guild has been released. As a result, we know they’re very strong. However, following the French Nationals this weekend, we were really concerned that there were some players in the top 10 who weren’t using the Miner’s Guild. This was completely unintentional. We want to ensure that going forward, the Miner’s Guild will make up the entire top 10 of every Guild Ball event in the foreseeable future. As a result, we’re going to release a targeted errata in order to bring the Miner’s Guild up to the point where they will hopefully kill the competitive game entirely. This was always the point of the Miner’s Guild, and it’s a real shame that it’s going to take an errata to achieve this goal, especially when we worked so hard on making them completely overpowered in the first place. Thanks for reading, we hope you have a pleasant April Fool’s Day. Alright, jokes aside, we have been paying attention to the Miner’s Guild over the last month. It seems that they are ahead of where we want them to be. While this is partially because they work so mechanically differently to other guilds, and they take some time to get your head round as an opponent, it also appears to be a balance concern even with these points set aside. 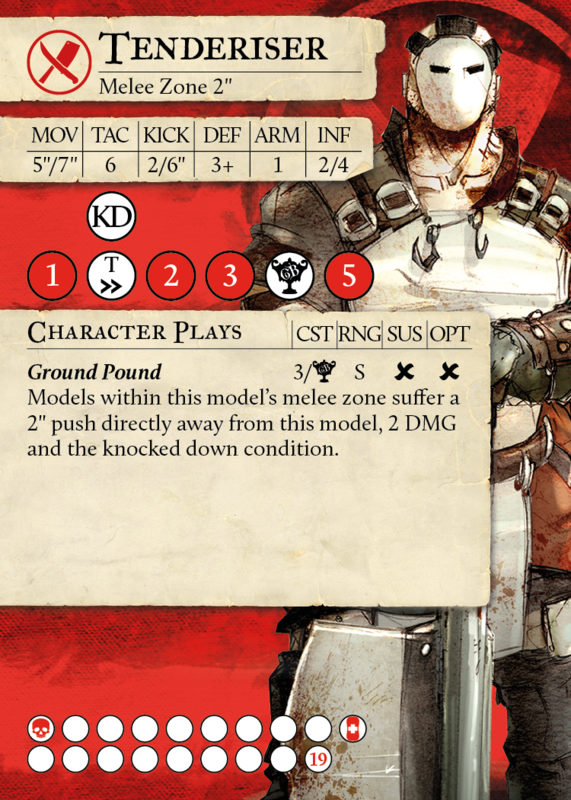 Guild Ball is particularly sensitive to balance miscalculations, because, most Guilds have a win rate somewhere between 55% and 45%, with only a few extreme outliers. That is a remarkable fact, and it’s something we’re phenomenally happy about. However, because that balance is so good, any outliers appear much more dramatic than would otherwise be the case. We’ve had some issues with balancing Minor Guilds in the past, and we know from experience it’s easy for them to slip beneath where we want them to be. When they first come out, they’re seen as exceptional, then people figure out what to do, and their win rates naturally drop off. The Navigator’s Guild are a particularly good example of this. A few months ago, the Navigator’s Guild were seen as extraordinarily powerful, with a very high win rate. Now, they seem to have dropped back to about average. However, it does appear that with the Miner’s Guild we dug a little too deeply, and they’re simply too strong. We believe that there’s no single obvious thing that’s necessarily pushing them over, it’s more that a small number of their many levers are just pushed one notch too high. We believe we need to tweak a few elements of the Miner’s Guild to get them where we want them. However, we also need a bit of time to test the changes we want to do to the Miner’s Guild. As a result, we will be releasing a small-scale targeted balance errata for the Miner’s Guild towards the end of April. This will only affect the Miner’s Guild, no other models will be taken into consideration for changes at this time. Thanks for reading, we hope this has addressed the concerns we’ve seen in the community over the last few weeks. Hey everyone! We hope you’re enjoying all of the releases and new toys you’re getting to see today! Just before we get into the errata blog, we’d like to draw your attention to a small change to the Regional Cup Organised Play document today. As the Miner’s Guild have now been officially released, the Engineer’s Guild can no longer use Union models in Regional Cup organised play events. In addition, from today, the Butcher’s Guild can no longer use Union models in Regional Cup organised play events either, even though the Cook’s Guild isn’t officially released until March 15th. This decision has been made due to the release of Veteran Boar today. During playtesting we did not take Union choices into account when testing Veteran Boar. At the time we believed Cooks would be released before then, and we’re worried about a couple of potential interactions between Veteran Boar and Union models. As a result, we’ve made the decision, much like last year at SteamCon with the Fishermen, to remove the Butcher’s Guild access to Union choices a touch earlier. This also means that the Butcher’s Guild may use their allied Cook’s Guild models (Roast and Cinnamon) in tournaments from today, providing the player has a legal model to use (such as Christmas Roast). 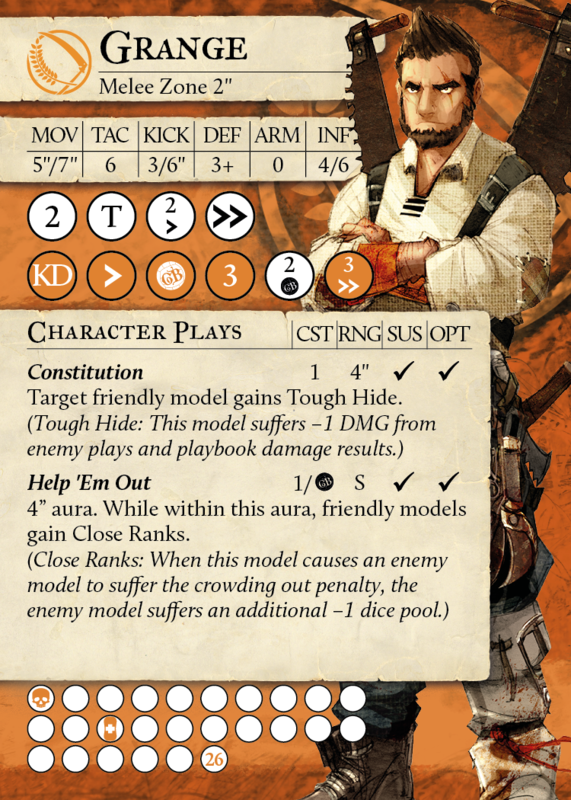 Today’s an exciting day for Guild Ball, with the release of the Miner’s Guild, four brand new captains for the existing Major Guilds, AND an errata! What a glorious bounty of #content. While we’ve covered the Miner’s Guild and the new captains elsewhere, this blog will be us diving into the errata and explaining our reasoning behind all of the changes. So to start off with, let’s go through the wording changes and tweaks that we’ve made to models purely based on feedback and questions we’ve gotten on the Rules Forum, then we’ll get into balance changes. The intent of this rule is that Mash can use it any time during his activation and gain the benefit of the free pass with the extended KICK range. This is relevant for the interaction with Ester’s Aria rule, so he can use the Heroic for free, then move away from her and use the free pass later in the turn. This change was because before he could ‘make’ a charge not ‘declare’ a charge, which technically meant opponents couldn’t declare a Counter Attack or Defensive Stance against the charge. This was not the intent of the rule, so we’ve clarified the wording. One the Rules Forum, we saw a good number of questions about the timing of this ability and the actions that it allows. This new wording should clear up these questions. Do note that the action taken as a result of Grim Vengeance now has to be the next action that Veteran Cinder performs. We just wanted to make clear with this rule that Memory cannot be brought back in the Maintenance Phase if it’s suffering the taken out condition, it can only be brought back via Brainpan’s Thought rule. It was pointed out that this rule was previously considered an active trait, while Pelage’s Grim Caress was not, despite the fact the rules work very similarly. This unifies the two rules. This is purely the Reanimate on Veteran Velocity’s card. Somehow in the midst of the Season 4 proofing, Velocity ended up with an older version of the Reanimate wording on her card. 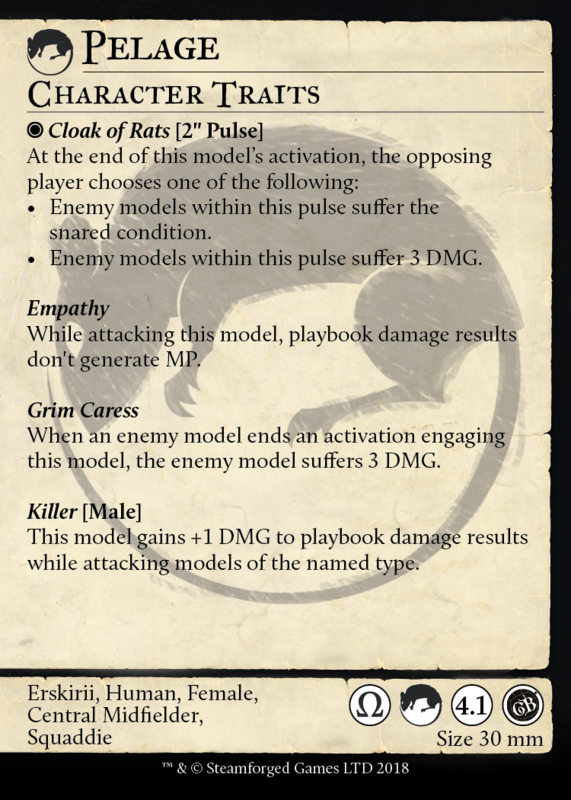 This unifies this rule with the rest of the Reanimates in Guild Ball. This rule was, simply, not as clear as it could have been. We cleaned up the wording and made it match the wording of Remote Detonation on Fuse because we realised that wording was more accurate. We got a lot of questions on the rules forum about the interaction of abilities that trigger on ‘hit’ like Stormwind, Momentous Inspiration, and Sun Strike. 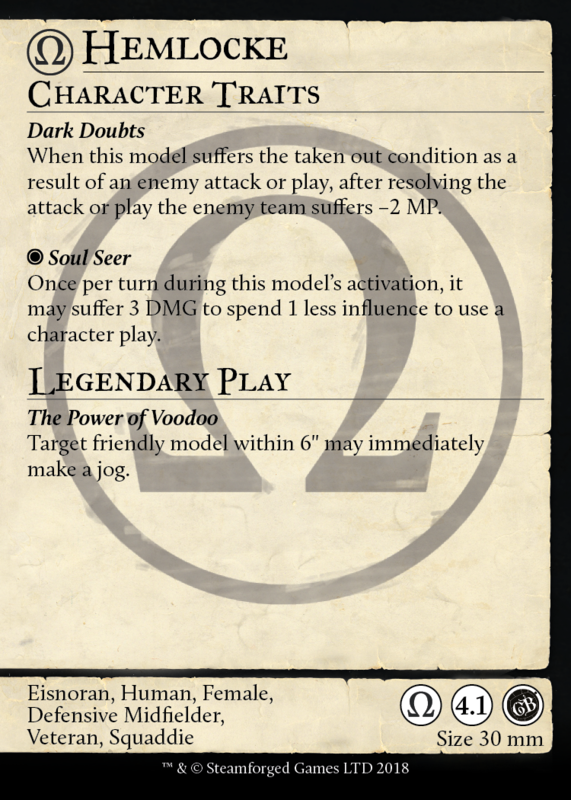 The intent was that Resilience cancels all effects of the incoming play, including these abilities. This rewording simply clarifies this intent, and makes the rule clearer. There was a typo on this rule before, so we fixed it. Team Player is a rule we’ve had a lot of questions on. A lot of people queried how this rule interacted with the check for taken out at the end of actions, and whether VHarmony could in effect take more damage that she had HP. This was not our intent, so we’ve added a sentence to this rule to make clear that Harmony can only suffer damage until she’s on 0 HP. 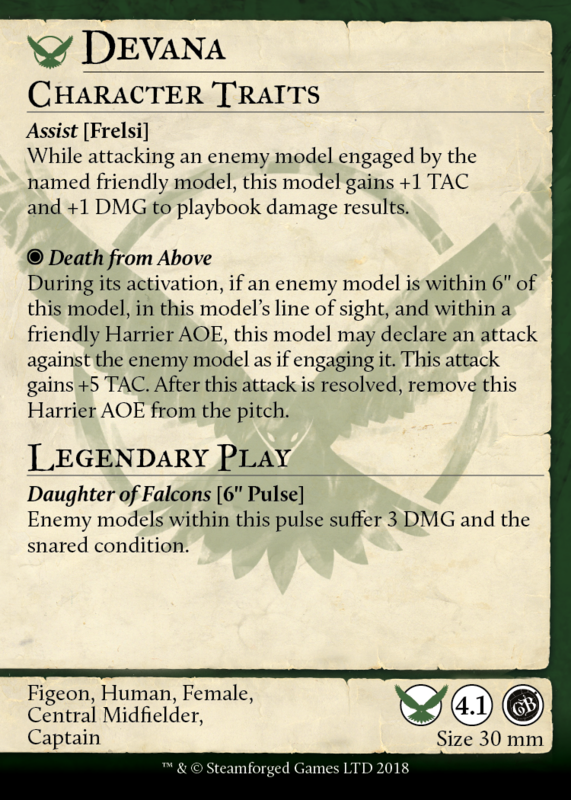 We added the word ‘immediately’ to the Heroic to make it clear that Fathom has to make the dodge at the moment she uses the Heroic, she can’t Heroic while next to some terrain then take the dodge later in the turn. In this section we’re going to break down why we made changes to certain models we felt were above or below the power curve. It’s worth noting that, similar to our Season 4 changes, we tend to try and bring models up more often than we bring them down, since that’s significantly more fun for everyone! The power reductions here are perhaps a lighter touch than some would have expected, but please play a few games before you judge the results. It’s also worth saying that we never want to nerf a model so hard that its pick rate drops precipitously. Our aim is always to equalise pick rates for models, and particularly captains, rather than reduce a model’s power to the point where it is never seen. Midas is keeping up his tradition of being the most mutable model in the game by receiving another change. We’ve noticed since Season 4 came out that Midas’s pick rate is very low compared to Smoke. We’ve attempted to buff him in a few ways to make him easier to use, and achieve what the Alchemists want to achieve in a different way to Smoke. To this end, we’ve improved his playbook, Midas Touch, and Fulmination in order to help him dodge around, inflict conditions, and score goals. We’ve also improved Lure of Gold to make his team support aspects better, since this is something Smoke doesn’t do in any way. We believe these changes really help Midas shine and define his role as distinct to Smoke. 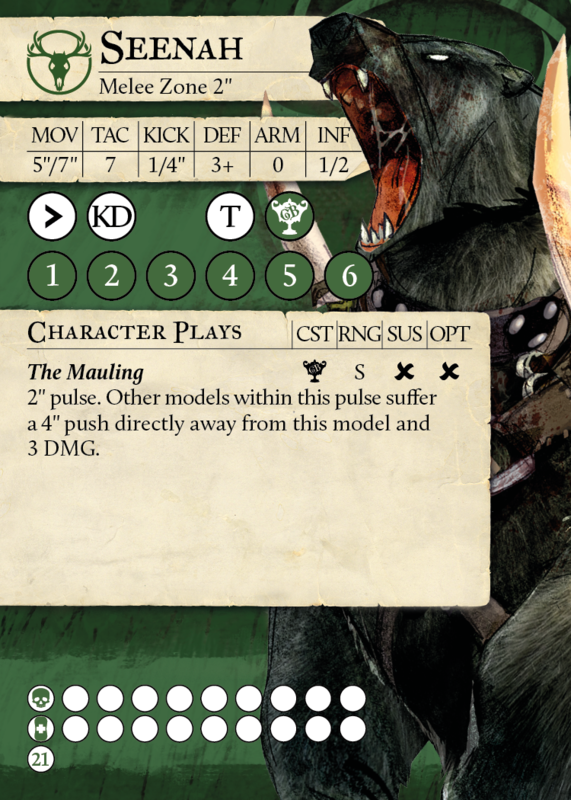 Stave is one of the most iconic models in the whole of Guild Ball. He’s been a key part of the game since Season 1, and it’s a shame that he doesn’t seem to be being played as much as we would like in Season 4. As a result, we’ve buffed him quite considerably. His stats and playbook have both seem significant improvements, with his damage getting better so his INF cap of 3 is more justifiable; each hit will be more impactful. In addition we’ve increased the push distance on Lob Barrel to 3”, so each time he uses that play it will change the pitch state more dramatically. That said, the raw stat increases here are the biggest changes. 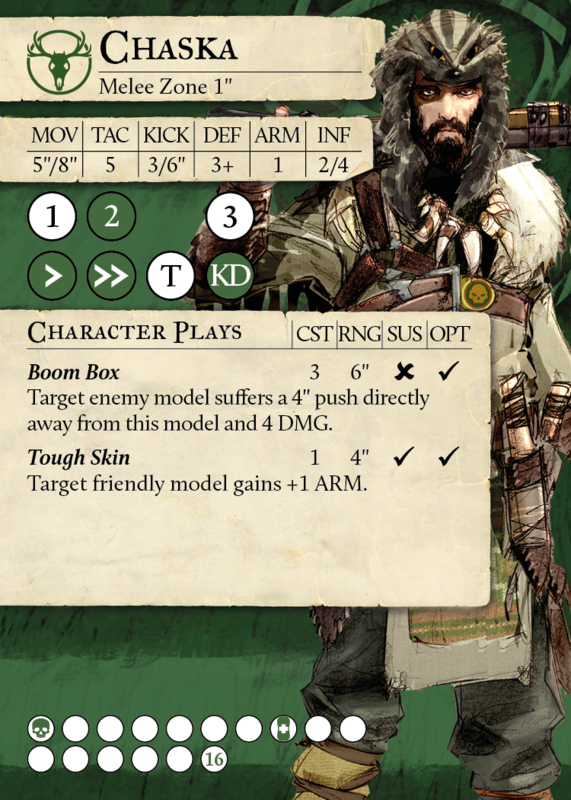 Stave brings an extra influence and moves faster, which also allows him to use Battering Ram more effectively. So the big change here to Tenderiser is the loss of Rush Keeper. Most of the rest of the card has been made better in order to make up for us removing Rush Keeper, since that was a fairly huge part of what Tenderiser used to do. This trait is one that we’d been uneasy about for a while. As part of the Season 4 development we tried to pare back each Guild to their core design space. The Butchers core design space is that they hit things really hard and they’re fast enough to catch the enemy to hit them really hard. They shouldn’t have powerful control effects on top of that offensive strength, that’s not really part of their core identity. Looking at the post Season 4 world with this mindset, we kind of believed we’d missed a trick and the opportunity to remove Counter Charge from the Butchers. As a result, we’ve replaced Rush Keeper with Celebrate THIS!, a trait which allows Tenderiser to inflict damage on enemy models if they score a goal, which is much more Butchery! 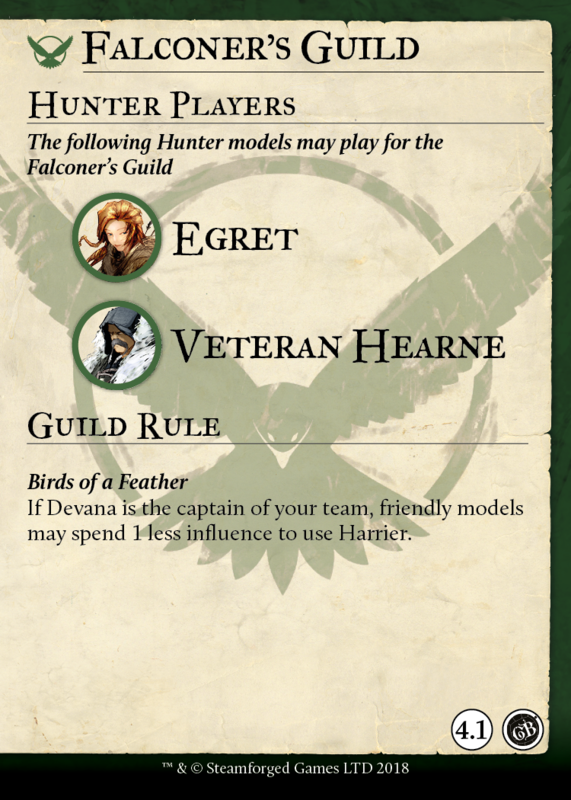 The Falconers have seen a number of changes in this errata. In addition to our developers attending lots of GB events, we also follow the community online, and look at statistics from the Longshanks website. 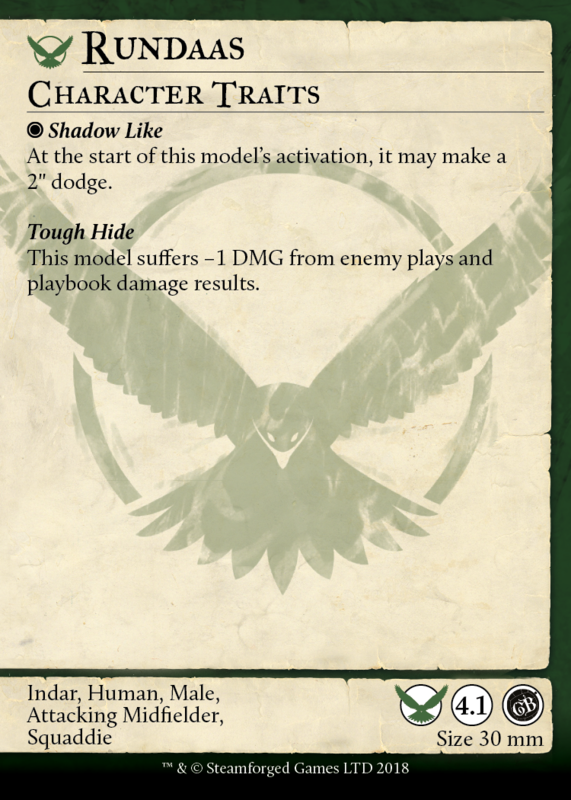 As a result, we know that the Falconers have been seen as one of the weakest guilds in the game for some time. 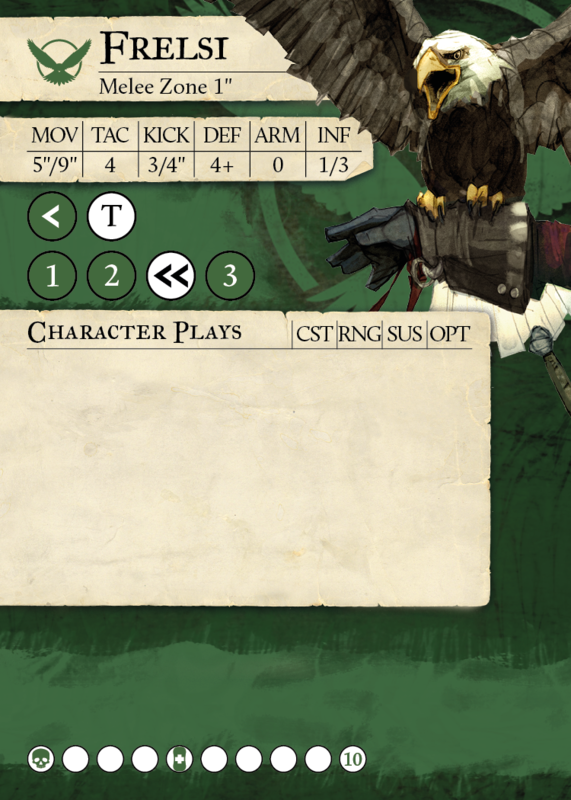 We’ve gone back and taken a hard look at the Falconers as a result, and we’ve tweaked them in numerous ways in order to make them easier to get results with. The first part of this is their new Guild Rule, Birds of a Feather. This rule means they can use their Harriers for a cost of only 1 Influence, which is obviously huge! It makes them massively more efficient and means they can afford to put out more Harriers during a turn. The ‘if Devana is your captain’ part is to make clear that Falconer crossover models don’t get the benefit when used in Hunters. Devana is very much intended to be the big hitter for the Falconers, the model which goes once your pieces are in place and delivers the knock out blow. However the wind up for her was a little too high, and the payoff a little too low beforehand. We’ve buffed her playbook to make her better when she does attack, and increased the TAC bonus from Death From Above to make those few swings she gets particularly impactful. In addition, she can take an addition influence, which makes her damage higher. The change of Airmail to being an actual pass allows her or the receiving model to dodge. This is especially good comboed with Death From Above and her momentous Tackle result on column 3 allowing her to strip the ball from enemy models surprisingly effectively. The key to getting the best out of Devana is knowing when to activate her. More often than not, all you need is one Harrier AOE on the pitch and Frelsi nearby for Devana to go in and cause enormous amounts of damage! She doesn’t need to rely exclusively on attacking enemies through Death from Above. Frelsi was a little hard to get use out of before. We’ve made her more of a difficult choice for the opponent, since her parting blows (and basically any attacks she makes) will inflict snared on the opponent. Her playbook is also improved, with higher damage potential and easier access to damage generally. 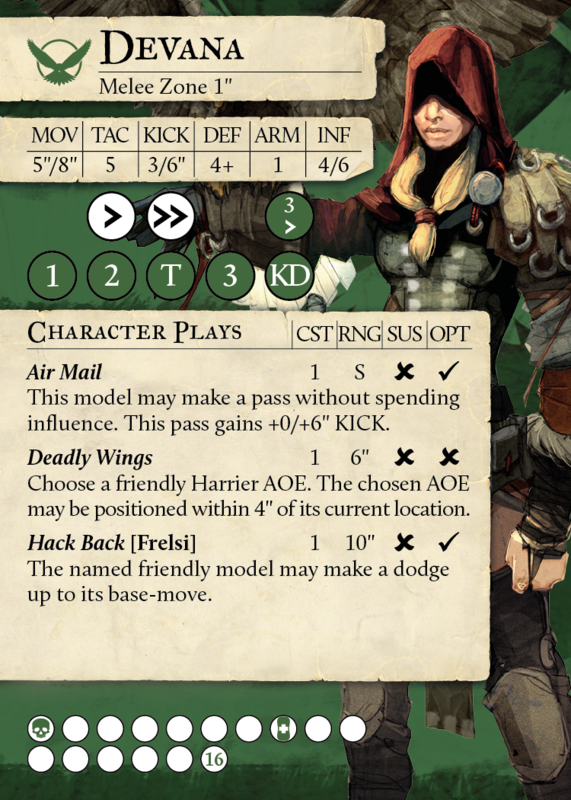 Rundaas is the secondary real damage dealer in the Falconers, behind Devana. We felt his damage was just a touch low for a model filling that role, so we’ve increased it in several spots on his playbook. This should help him feel like he’s better at doing his job. Grange is a bit of an odd one. Late in the Season 4 playtesting, we came up with the notion of removing all damage and TAC buffs from Farmers and starting all their playbook damage on 2. We still believe that this was the correct decision, but due to the lateness of the call, we did think that we might struggle to get everything about Farmers to where we want it to be. Grange is one place where we feel we missed the mark. He felt a bit aimless prior to these changes, and so we’ve focused him and improved him where it counts. Standouts are Help ‘Em Out becoming an aura, allowing all friendly models nearby to benefit, and For The Family affecting shots too. In addition as the Planter captain, we felt that his impact on the planting game was a bit too low turn to turn, so we’ve upgraded Planting Season to the brand new Planting Master. Much like with the changes to Grange, we didn’t feel we’d entirely settled Thresher correctly into his role at the start of S4. As the Reaper captain, his damage output should be high, and especially with the changes to Grange, we didn’t feel that it was quite high enough. We’ve improved his playbook damage a tad by bringing the 3 damage down a column, albeit non-momentously, and given him more options higher up. The changes to both Farmer captains are just intended to push them more in their targeted playstyles. We felt that Boom Box was simply doing too much damage. As a result, we’ve lowered the damage on this play from 6 to 4. We’ve also dropped the double push on his playbook to column 2, rather than 1. This was because we felt it was too reliable a counter attack when it was on column 1, it made Chaska simply too survivable. Chaska should still be seen as a solid pick for any Hunters team without being overbearing to Hunter opponents. Seenah is a model that we think a few people may have expected some harsher changes on. It’s worth noting that we don’t ever want to take a model out of the game entirely, and the bear’s damage should be the key thing about it. What we have done, however, is reduce the splash damage by moving the Mauling up by a column and getting rid of Crucial Artery. While the bear’s damage should be high, it felt just a touch too high previously. The other major change is the removal of the double push on column 1 to a single push, making the bear’s counter attack MUCH less punishing and making it more of a glass cannon style piece. Seenah still has extremely high damage, but now has poor defences and a poor counter attack. The biggest change on Zarola is one which is mirrored in Morticians. We felt, when examining these guilds, that the biggest problem with both of them was the existence of Midnight Offering. This play offered far too many options and far too much ability to stand back and play a standoffish playstyle. Following a LOT of internal conversations about what we can do with this, we eventually decided to make it a Legendary Play. Midnight Offering is immensely powerful, and should be a fantastic tool once per game for the friendly team. This ensures that the power of the effect is stuck to a single turn. We’ve also slightly buffed Zarola’s playbook in order to make up for bringing her down in this way. The only change to Veteran Hemlocke is the change of Midnight Offering to a Legendary. Unlike with Zarola, we didn’t feel we needed to bring up her playbook in order to compensate. Hemlocke has a really top notch toolkit even with Midnight Offering becoming a Legendary. We’ve only made a single change to Scalpel. The Heroic Play no longer allows her to use Spirit Bomb without spending influence. This is quite a big change, since she has a poor KD potential, so if an opposing model can disengage from her, she now has to spend 2 influence to re-engage rather than 1 MP. This cuts her potential damage quite considerably, and forces her to make some really hard choices about her target selection. In addition, the bigger change to her is the loss of Midnight Offering every turn, which previously allowed her movement to spike up to incredible levels. The Order have been a point of contention for a while. They have a huge number of extremely powerful abilities that they can use when they have possession of the ball, but they can sometimes struggle to retain or retrieve the ball once they’ve scored a goal. This disconnect led us to their new Guild rule, Ball of Light. This rule is one of the biggest changes we’ve ever made to a guild, and is incredibly exciting and fun to use. It provides the Order with a huge number of new options, and lets them use all of their exciting ball handling abilities even when they don’t have the ball. We’re incredibly excited to see what you all do with this ability and we think Ball of Light is a serious contender for the most exciting change in this errata. Pelage felt a little underwhelming when she made attacks, so we’ve bumped her playbook damage up quite considerably to make her more impactful. In addition, we found that while Empathy disincentivises enemies from attacking Pelage, her low HP meant that often they could take her out in a few swings, preventing her from gaining a tonne of benefit from this rule. As a result we increased her HP to 12 to make her a touch more difficult to inflict the taken out condition on. In theme with much of this errata, we felt a number of the current Minor Guilds could use a little bump upwards, and much of their strength comes from their captains. With Piper, we have made a couple of tweaks to make him easier to use. The first is the addition of a push result to the momentous tackle on column 1. This lets him generate momentum much more reliably, as well as being an absolutely stonking result for stripping the ball from enemy models. The second change is a bit smaller, we’ve added 1” to the push distance of his Legendary. This allows him to move people around more flexibly if he needs to. Well, last model! It’s been quite a trek, and we hope you’re still paying attention! Squeak has been maligned (a touch unfairly) as one of the worst mascots in the game before. We didn’t think he deserved quite such harsh criticism (Dreadful Shriek is a ridiculously powerful effect for a mascot), but it was fair to say he didn’t contribute as much as we’d like. As a result we’ve upped his Kick to 2/6”, making him a much stronger Reverie target, and also increased the range on Dreadful Shriek by 1”. The biggest change is his new Legendary, The Rat King. This represents Squeak, as the largest rat, dominating all the other smaller rats and getting them to move the ball for him! This Legendary also lets Squeak be much more of a threat on the ball, and stops the enemy team just dropping it on the pitch somewhere to kill it. Well, there we go! Lots of changes to go through, we hope you’re all excited to get out there and play! 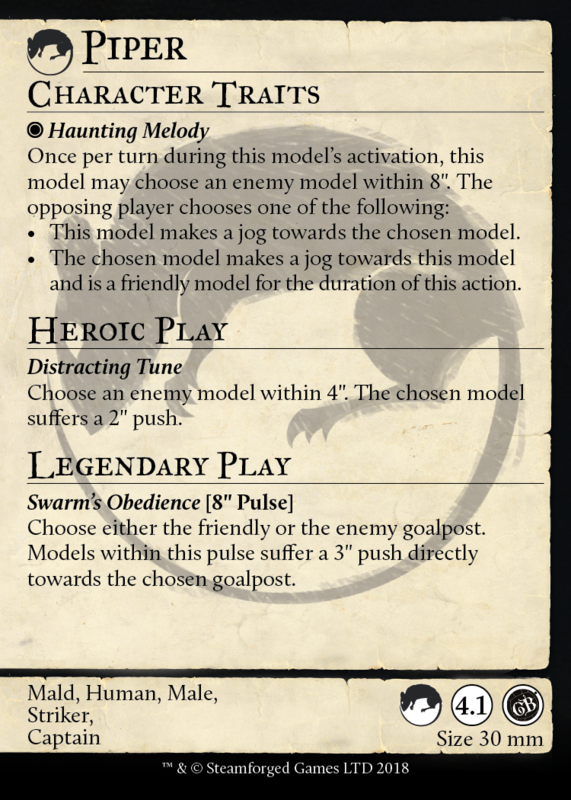 Today’s an extremely big day for Guild Ball, and we’re extremely keen to see your reactions. But wait…there’s more! Now we’re going to run through the changes to the rulebook in this errata, almost all of which are based on questions we’ve been asked in the Rules Forum. The remainder are clarifications for rules which are much more relevant from today. Without further ago, let’s get into it! The previous text used the phrase ‘intervening model’ which was causing confusion with the usage here vs the usage in the kicking section, which was slightly different. As a result, we’ve changed the text here to make it clear that this definition is different. This change is to clarify that you resolve conditions one model at a time and not all at once. It makes timing clearer and should remove questions around things suffering the taken out condition in the End Phase. Previously, this text said ‘a model that gives up possession of the ball in this way cannot regain possession’. This actually wasn’t the intent of the rule, since there are ways in which a model can unsnap the ball and then have it be passed to them. This wording change clarifies that and makes the intent of the rule more obvious. Skatha’s Snowball play added a way in Season 3 for a model to be in possession of multiple balls. At the time, since her ability was unique, we felt we could deal with any rules queries via the Collected Clarifications. Since, as of today, we’ve released a second, much wider ability for a second ball to be put into play (check the errata, here [link]), we felt that the core rules needed an update to make clear how any multiball situation would be resolved. This section covers those rules. We got a lot of questions on the rules form about end of activation abilities and goal kicks. This section just makes clear that you resolve any end of activation abilities BEFORE making the goal kick once a goal has been scored. Simple tightening of timing. We made a slight error in the Season 4 rulebook, and this rule didn’t specify that the successful pass had to be to another model, so a model could pass to a target spot on the pitch and then dodge from that. This was pointed out by one of our players, a chap called Chris Schlegel, and subsequently nicknamed the Schlegeldash. This was ruled on the rules forum almost immediately, and this errata change codifies into the rulebook that the Schlegeldash is not a legal manoeuvre. Sorry Chris. This wording was previously a bit unclear, in that sounded a bit like the kicking model could use Pass and Move and the receiving model could use Snap Shot. This was not the intent, so we’ve cleared up this wording. Page 23, Run the Length! This is simply to tighten up timing around Run the Length. Run the Length triggers at the same timing step (end of activation) as, for instance, Second Wind, and is resolved simultaneously with all other end of activation effects. Well, there we go. 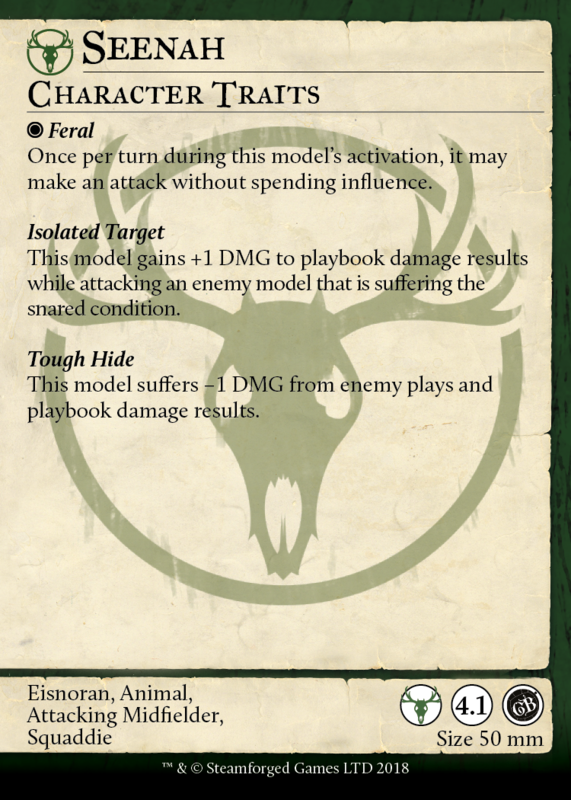 This half of the article is, we’re sorry to say, much less interesting than the one with the model balance changes in it but we hope it’s cleared up the changes we made to the rulebook in this errata and why. Join us on SFG Live tomorrow at 4PM when we'll be playing Ratcatchers vs Farmer's Guild! 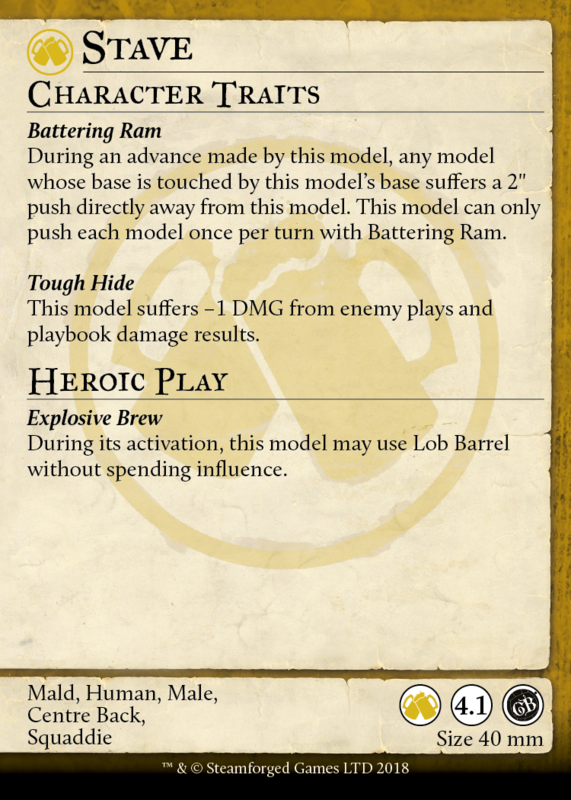 Click here to download the latest Guild Ball Errata Cards.